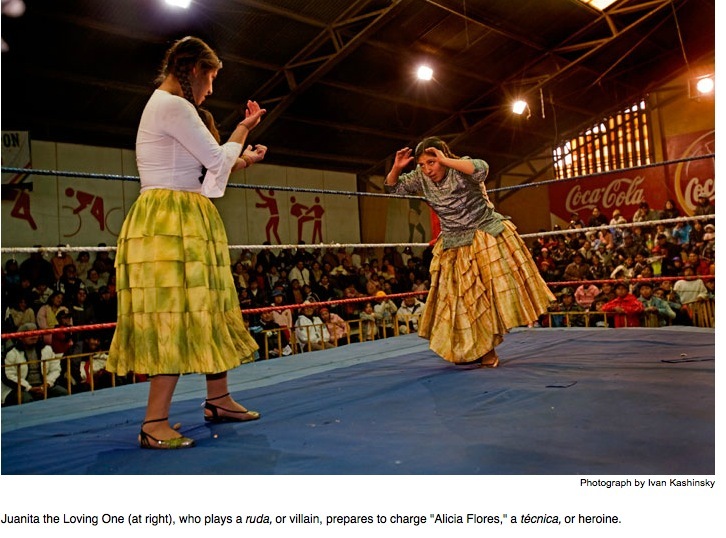 In the wrestling rings of Bolivia, skirts fly as cholitas fight back! At the largest public gymnasium in El Alto, Bolivia, daylight is fading from the windows, and hundreds of people along the bleachers are growing impatient. They have been sitting for more than two hours now, jeering and whistling and yelling encouragement at the succession of artistas who have faced off in the center of the gym to match wits and perform dazzling feats of strength and skill. But it is growing late, and over the blaring disco music, foot-stomping and impatient whistles can be heard in crescendo: “Bring them on!” The music grows louder, the whistling too; there is a sense that rebellion may be about to erupt, but at last the houselights flash and dim, and the music shifts to the chunka-chunka beat of a modern Bolivian huayno. An announcer emotes into the microphone, the curtains leading to the locker rooms part, and “Amorous Yolanda” and “Evil Claudina,” this evening’s stars, make their longed-for appearance to ecstatic applause. Like many of the women of Aymara descent in the audience, Yolanda and Claudina are dressed to the nines in the traditional fashion of the Andean highlands: shiny skirts over layers of petticoats, embroidered shawls pinned with filigreed jewelry, bowler hats. Their costumes glisten in the spotlights while they make a regal progress around the bleachers, greeting their public with the genteel smiles of princesses, twirling and waving gracefully until the music stops. That’s the sign for the two women to swing themselves deftly onto the wrestling ring that has been the focus of this afternoon’s activity. Swiftly they remove their hats, unpin their shawls, and … whap, whap, whap! Claudina belts Yolanda one, Yolanda slaps Claudina, Claudina tries to escape, but Yolanda grabs Claudina by her pigtails and spins her around, and WHAM! Claudina whirls through the air, petticoats and braids flying, and lands flat on her back on the mat, gasping like a fish. The audience goes nuts. Welcome to the delirious world of Bolivian wrestling. In the cold, treeless, comfortless city of El Alto (“high point”), 13,000 feet above sea level, there are one million people, most of whom fled here over the past three decades to escape the countryside’s pervasive misery. The lucky ones find steady jobs down in the capital city of La Paz, which El Alto overlooks. Many sell clothes, onions, pirated DVDs, Barbie dolls, car parts, small desiccated mammals for magic rituals. The poorest alteños employ themselves as beasts of burden. All of them battle hopeless traffic, a constant scarcity of fuel and water, the dull fatigue of numbing labor, the odds that are stacked against them. When they’re done working, they need to play, and when they want to play, one never knows what they will come up with. Lately, they’ve come up with the extraordinary spectacle of the cholitas luchadoras—fighting cholitas—which has given new life to Bolivians’ own version of Mexican lucha libre, a free-form spectacle somewhere between a passion play, a wrestling match, and bedlam. “Watch out!” the entire audience shrieks. Yolanda has been celebrating her victory, but Claudina, as proof of her evil nature, is about to lunge at her from behind. Yolanda spins too late; Claudina knocks her flat and clambers like a crazy person onto the ropes. “I’m the prettiest!” she yells at the audience. “You’re all ugly! I’m your daddy! I’m the one the gringos have come to see!” Indeed three rows of ringside seats are filled with foreigners, all pop-eyed, but they’re actually irrelevant. It’s their fellow Bolivians the cholitas are performing for. Claudina, who is officially a ruda, or baddie, has taken a swig of soda pop and is spraying the public with it at the precise moment that Yolanda, a técnica, or goodie, pounces on her and drags her up to the bleachers, sending the spectators there scattering in blissful, screaming alarm. Yolanda wins! No, Claudina wins! No, Yolanda! But wait! The audience screams in warning again because a new menace has silently made his entrance: “Black Abyss”—or maybe it’s “Satanic Death” or the “White Skeleton”; it’s hard to keep track—has leaped into the fray and has Yolanda in a ferocious leg lock. The situation looks hopeless, but no, here comes the “Last Dragon,” out of nowhere, and he’s carrying a chair! And he’s whomping Black Abyss, or maybe the Skeleton, or maybe Yolanda, on the head with it! Even Claudina seems to have lost track of who’s who: She’s taking a flying leap at her own ally, the loathsome “Picudo.” “He is destroyed forever!” the announcer yells frenetically. Or almost forever: In lucha libre, no defeat is ever final. “What I want to make absolutely clear,” says Juan Mamani, who fights as a rudo under the lucha name of “El Gitano” and who runs the show, “is that it was me who came up with the idea of the cholitas.” Mamani is a tall, angular man whom it would be kind to call unfriendly. He cuts phone conversations short by hanging up, does not show up for appointments he has been cornered into making, and tries to charge for interviews. His cholitas are terrified of him. “Don’t tell him you called me; don’t tell him you have my phone number!” one of them begged. I hunted him down near the El Alto gym, and after an unpromising start—he kept trying to duck past me—I said the magic words “Mexico” and “Blue Demon.” The face of Juan Mamani, the ogre, was suddenly wreathed in smiles. “My greatest passion is lucha libre,” he said. “And for us, Mexico is the example. Blue Demon is for me lo mas grandioso”. Mamani’s wrestlers all hold daytime jobs, and he makes a living from a small electrical-repair shop. But he has invested a good part of his life’s earnings in a huge wrestling ring at home, where his group trains. He pays his wrestlers between $20 and $30 a match and probably doesn’t clear vastly greater amounts himself. “Here in Bolivia it’s impossible to make a living from this great passion of mine,” Mamani said. His dream was to create a Bolivian school of wrestling heroes to equal the feats of the great Mexican lucha legends; their daring leaps and backflips, their unique costumes and regal bearing. Had I seen Blue Demon fight? Really? He shook my hand as I left. 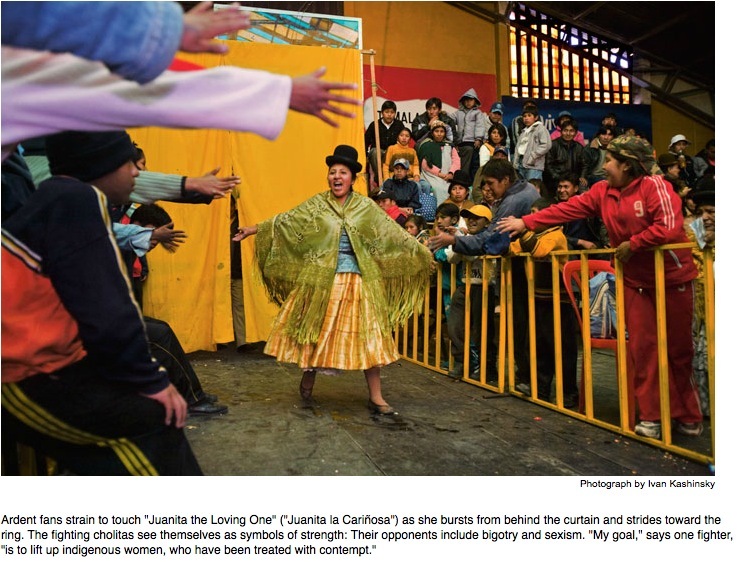 About seven years ago, when he was fretting about the diminishing audience for the weekly lucha libre spectacle at the El Alto gym, Mamani had the inspired idea to teach women to wrestle and put them in the ring in cholita clothes. “Martha la Alteña,” an outgoing luchadora, not remarkably muscular but very strong, was among the 60 or so young women who answered Mamani’s open audition call. Like several of the eight or so who ended up staying, she comes from a wrestling background. “My father was one of the original Mummies,” she said proudly, referring to one of the best loved, or most dreaded, of Bolivian lucha’s creatures. Amorous Yolanda was also inspired by her luchador father, and even though her parents separated on unfriendly terms when she was an infant, she used to sneak into El Coliseo in downtown La Paz—long since gone—to watch him perform. “But a lot of times men don’t believe in women,” she told me. “Once I heard my father say that he wished he’d had a son instead of me, so he could follow in his footsteps as a luchador.” When she heard about Mamani’s casting call, Yolanda, then still called Veraluz Cortés, raced to audition, leading to a temporary rift with her father. Whether her lucha stardom also contributed to the breakup of her marriage is not clear. Outside the ring, Martha la Alteña generally wears what is called the senorita style of dress—blue jeans and sweaters—and part of the glamour of her cholita costume is provided by turquoise-blue contact lenses. Yolanda, on the other hand, who is thin and very intense, wears a bowler hat and petticoats and skirts, even when she is knitting sweaters at her day job, and considers herself an authentic cholita. And indeed a few minutes later the Mummy Ramses II is staggering around invincibly in a red-stained jumpsuit and a fright wig, dragging one cholita behind him while another one looks for something to set him on fire with, and the kids are screaming in delicious terror, and Señora Cancina is yelling things at the Mummy that cannot be printed in this magazine, grinning broadly as she does so. The Mummy is slamming his victim against the wall, and it looks tough for the cholitas, as the announcer warns us, in this definitivo y final combate—it looks very, very tough. But something tells me that you can’t keep a cholita down. Here comes Martha, flying through the air! For more pictures, use this link, thank you. This entry was posted in Bolivia, La Paz, Tourism and tagged sports, women's wrestling. Bookmark the permalink.